This promise, unfortunately, is not kept, as evidenced by the political focus, by the failure to correct factual inaccuracies, and the TPM/Libertarian philosophical positions clearly taken by Dr. Foley. This does not mean that the The Tea Party does not have dedicated audiences. Those who share Dr. Foley’s “admiration and respect for the movement” will find this book invigorating. Those who do not but who wish to understand the three major principles of the movement—Limited Government, U.S. Sovereignty, and Constitutional Originalism—will find it quite informative. This review will only refer to three issues found in the chapter Limited Government, only to maintain what this reviewer hopes to be an honest, non-political review. In defining the “principles” of the TPM, the Libertarian ideal of limited government and a free market with little or no regulation is well defined, along with the general arguments that coincide with the overriding philosophy of the TPM. This includes the elimination of organizations and departments that the TPM believe are not supported by the Constitution, most notably the Federal Reserve Banks and “Obamacare.” It is here is where the reader must sift through the political philosophy of the author. For example, Dr. Foley’s descriptions of the arguments concerning the constitutionality of the Federal Reserve are historically accurate. The original arguments concerning a national banking institution date back to Alexander Hamilton and the beginnings of America’s two party system; however, Dr. Foley does not correct the factual errors made by U.S. Senator Rand Paul (R-KY), whom she quotes, in his statements concerning the Federal Reserve. She does appear to reinforce them. Dr. Foley does not correct Sen. Paul’s errors. A second example is Dr. Foley’s continued use of partisan TPM, Republican Party, and Libertarian titles when describing legislation with which they firmly disagree. The law passed by the then Democratic lead Congress is called the “Patient Protection and Affordable Care Act,” not the politically charged “Obamacare.” In addition, Dr. Foley fails to provide the TPM oppositions’ positions, with or without rebuttal, which fails to meet the basic criteria for a fair and honest discussion. Yet the TPM’s arguments concerning American exceptionalism, overregulation, and the principle of Constitutional Originalism make this a “must” read for those on both sides of this discussion. Is this a recommendation to purchase The Tea Party? Absolutely. 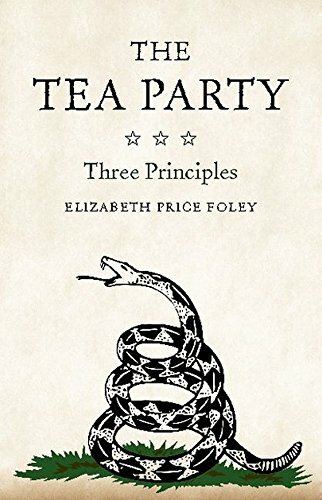 For those who agree with the TPM’s political principles, The Tea Party will read as an honest and reasonable depiction of the movement, a reinforcement of the ideals of individual and states’ rights, government grown too large and intrusive, and devout patriotism. David Rosman is an award winning editor, writer, professional speaker, and college instructor in Communication, Ethics, Business and Politics.